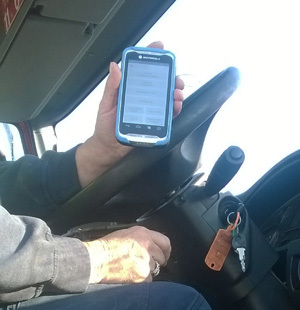 Waste management company Cleansing Service Group (CSG) has reported a dramatic increase in reporting of issues and incidents relating to health & safety, environmental protection and customer service since issuing its drivers with new hand-held digital devices. The company equipped drivers carrying out domestic off mains drainage clearance operations with Personal Digital Assistants (PDAs) a year ago. Initially they were seen primarily as an aid to improving fleet efficiency and reducing paperwork but have rapidly become an invaluable tool for instant reporting of health and safety issues such as near misses and unsafe sites. The devices incorporate a custom electronic work ticket application, GPS tracking with date and time logging, as well as barcode, camera and navigation functions. The driver uses the PDA to transmit job information back to the company’s central systems, adding notes or photographs when relevant. The portable units are docked in the cabs of CSG vehicles emptying around 60,000 septic tanks and cesspits throughout the UK – the majority of them in rural areas. As well as using them for basic operational admin tasks, drivers are increasingly using the devices for real-time job reporting both on the road or at a customer location, and they have become a valuable tool in safely managing, monitoring and communicating with lone workers. This reporting can include anything affecting health and safety, from floods and traffic accidents to potentially dangerous faulty drainage covers, site access problems and potential hazards, as well as recording job specific details to improve the service provided at each location. “We have seen a significant increase in the amount of feedback we are now receiving from our drivers since the introduction of the system,” said CSG’s Sewage Treatment Manager Chris Febrey. “Many of these might have been noted in the past on a piece of paper but not recorded properly or flagged up to operational managers. “Now pictures and details are being sent in real time which is helping us to respond more quickly to issues and improve customer service by addressing problems straightaway or issuing advice to a customer that something at their property or premises is not safe or working as it should be. “By having a full record like this, it may help to prevent a recurrence, pinpoint a weakness in a problematic waste system that we can address or show a pattern of events from which lessons can be learned. “For example, one of our drivers attended a site and found the septic tank pump was not working, which could have meant the system overflowed resulting in an environmental pollution incident. CSG also has a huge fleet of vehicles carrying out potentially hazardous industrial waste operations and the company is planning to issue PDAs to all drivers of these vehicles in 2016.